It is morning. Cloudy again, with a breeze from the east. I listen to the sound of ocean waves, lapping against a tropical beach. 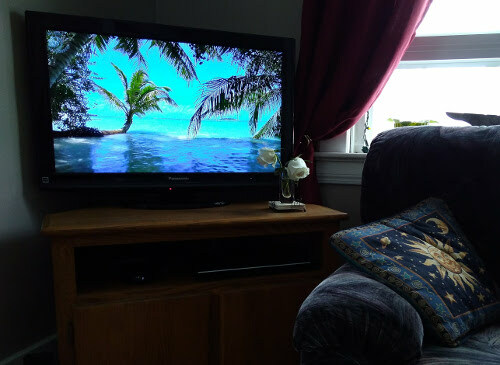 Youtube delivers this to me with an image of palm trees and a gentle ocean. If I close my eyes, and listen, I can believe that I am there, sitting in a thatched gazebo out over the ocean on a tropical island. I sit at a table, a table that is sturdy and made from hardwood, sawn in someone’s back yard. The chair is straight and hard. I have a coffee in hand, made from my own coffee press, but from freshly roasted and ground local beans. It is easy to imagine this. I can be anywhere I want, at least briefly. Until I hear the furnace fan cut in, warming the house after being cooler all night. I feel the soft sofa at my back. When I open my eyes, I see snow. Great piles of it along the street where the snow plow pushed it up. Dirty snow with lacy patterns created as the sun slowly collapses the pile. Slow is good now, although we are all so eager for spring to come, but not for a fast melt that will flood basements and overflow the creek. But still, I just want it all to be gone already. I want to stride down the sidewalk on dry pavement. Walk barefoot on green grass – even the prickly stuff that is my lawn. I want to ride my bike. Walk out on the trails by the reservoir. Hear birds and insects. Even mosquitoes. Watch the flocks of geese flying eagerly north. And know that I made it. I made it through this long, dark winter without Galen. The worst should be over. Yesterday was six months since he died. Now life is returning to the land, and, as it returns, I can feel my life expanding. I have some plans now. Some dreams. I am discovering that my joy comes from inside of me. Not from the world around me. And as I find that joy within, I also understand better that my sorrow also comes from within. And that I can embrace both the joy and the sorrow. I can stay connected to my memories of my life with Galen and I can create a life for myself without him. The tears still flow, but in the process I can explore the deeper questions of life that have been forced upon me. Finding meaning in death and in life. And so my life can be both richer and leaner at the same time. I now have space for joy and anticipation and happiness and dreams. Each step is a new journey. The seasons sure paralleled your life this year. Glad spring is here and for the new growth of dreams in your heart. You have such a beautiful way with words and feelings. May spring put an ease in your journey. I’m recovering from surgery and would love to have you drop in for coffee. Miss seeing you. Good morning Rebecca, I checked in on you blog to see how you are doing. I think of you and Galen and hope you are finding the pain and sorrow easing with time. My thoughts are with you.